It looks very much like him. I can’t say it’s him. I have no proof. I can’t even say the pictures are genuine. He was waiting for Ted Cruz”s father. Wow! You’re way ahead of me on this one. Donald Trump (Yeah, THAT Donald Trump) alleged that Ted Cruz’s father was with John F. Kennedy’s assassin shortly before he murdered the president. 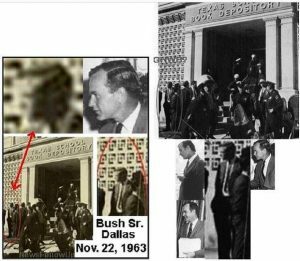 Rafael Cruz was supposedly pictured with Lee Harvey Oswald handing out pro-Fidel Castro pamphlets in New Orleans in 1963. "He was waiting for Ted Cruz”s father." Bush Sr. visited Brattleboro many years ago. Part of a handful of presidential types to pop by the ‘boro over the years. I heard he was booed at the train station. Anyone around here see him when he came? Have details to share? CIA documents show an operative named George Bush who was an there at the time. His official response when questioned was that was “a different George Bush” that worked for the CIA at the time. The Cruz connection is much more tenuous, even though the exiled right wing Cuban community was used as CIA assets, but there is no documentation that I’ve seen suggesting Rafael Cruz was an operative. We deprecate Putin, saying he was a member of the KGB, but we forget that Bush was director of the CIA. KGB-CIA? Same circus, different clowns.